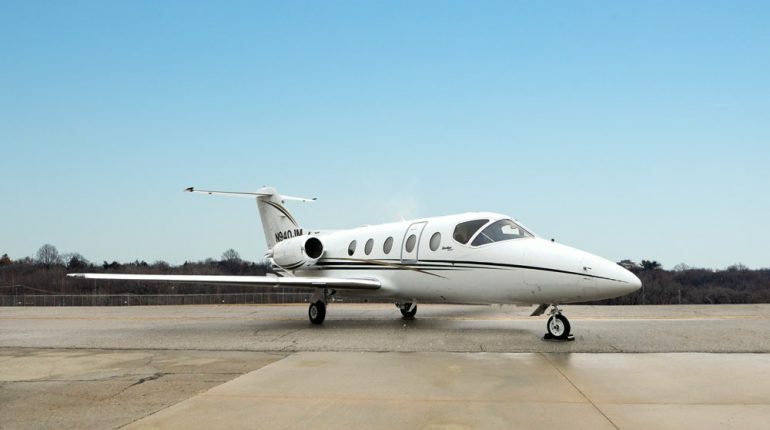 This outstanding aircraft is based in Indianapolis, IN and may be viewed by appointment. 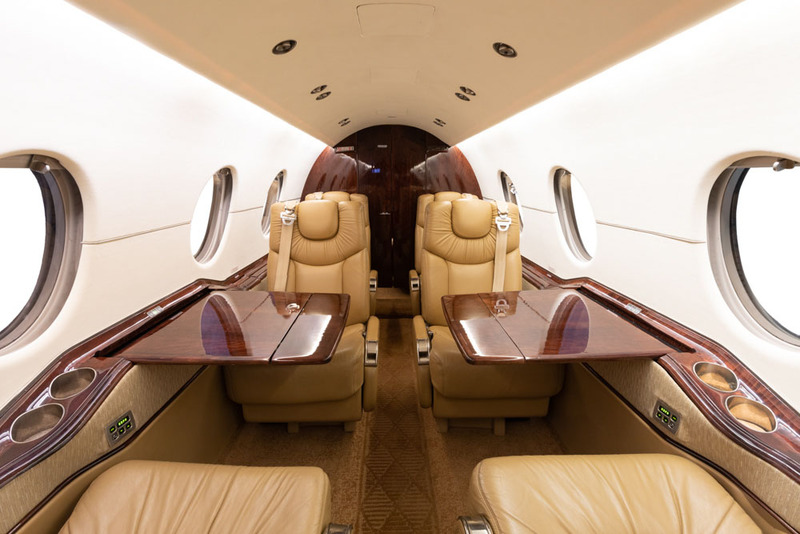 This Hawker 400XP features an eight (8) passenger interior, with a forward right-hand galley/closet, an aft belted lavatory, and a tail-cone main baggage compartment. 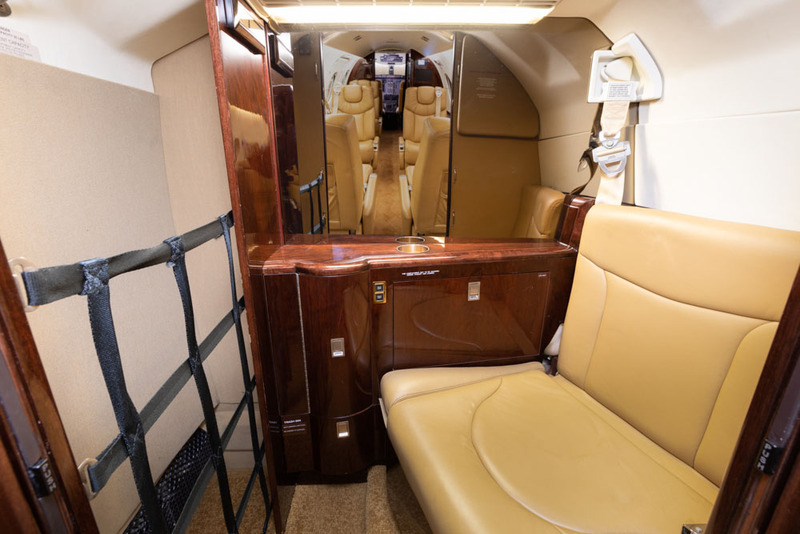 The cockpit and lavatory each feature dividers with pocket doors for added privacy. 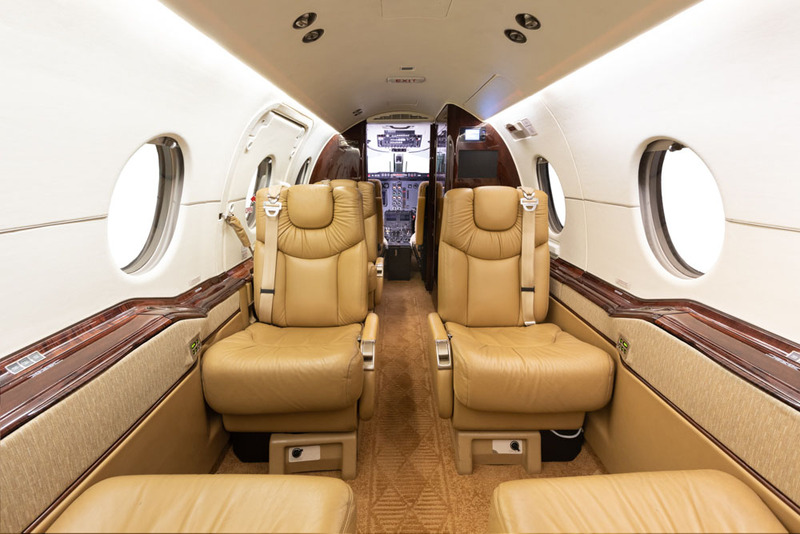 Passenger seating consists of a forward left-hand aft-facing seat, a center four-place club, two aft forward-facing seats, and a belted lavatory seat. 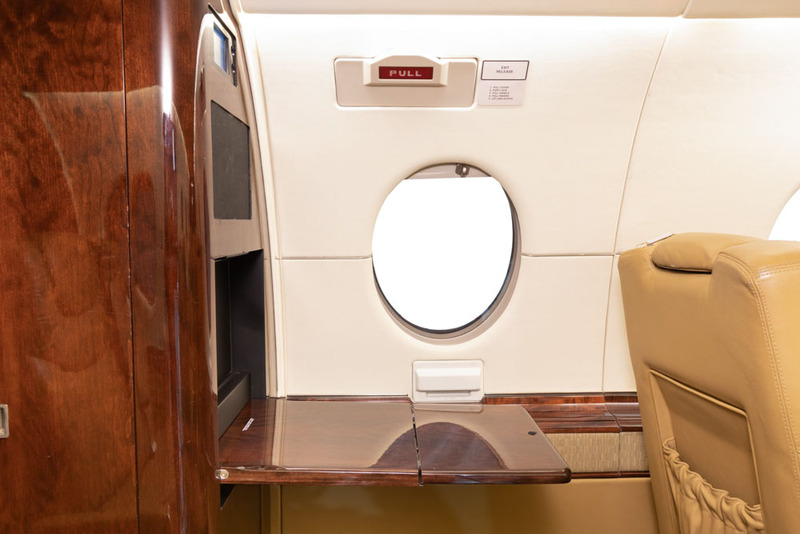 Stowing tables are located at the center club and on the forward right-hand cabin bulkhead. 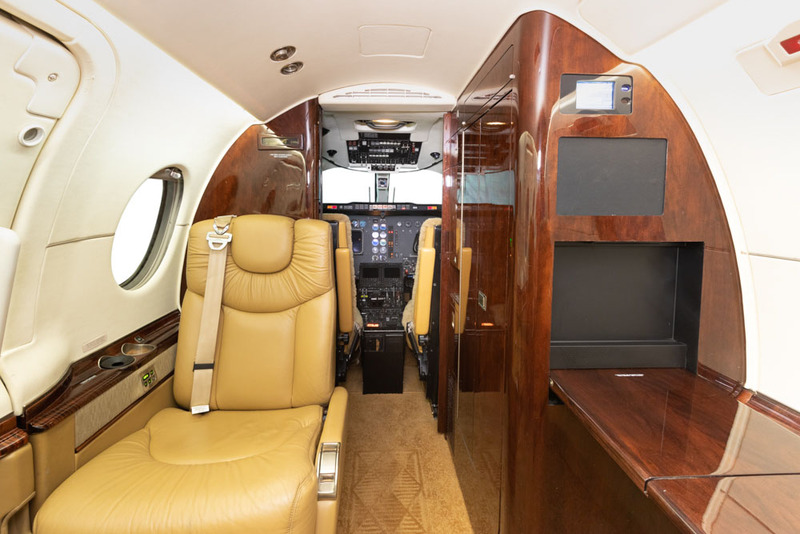 The Honeywell cabin management and entertainment system equipment consists of main cabin individual headphone panels, a cabin temperature control panel, a cabin speaker system, XM® Radio, a forward bulkhead AvVisor® cabin display system. The forward cabin features two (2) 115VAC 60Hz power outlets. 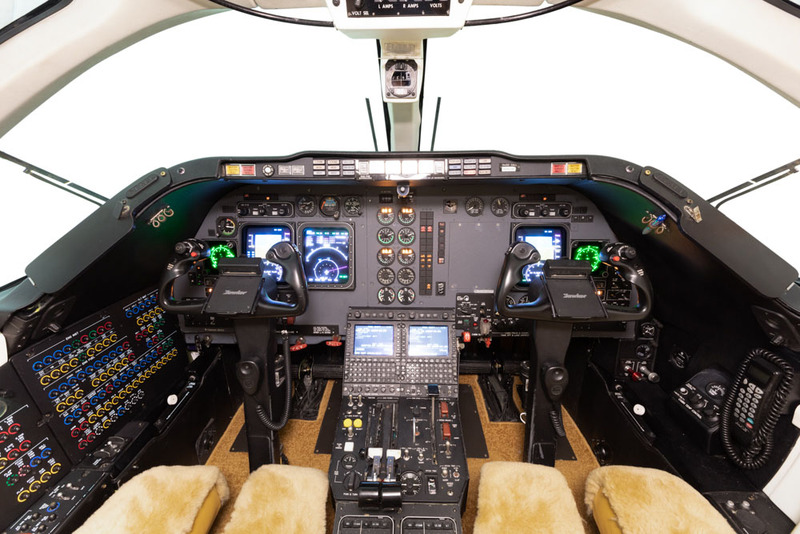 This aircraft features an Aircell® ST 3100 Iridium Satcom with cockpit and cabin handsets. New cabin carpet was installed, cabin seats redyed, the cabin lower sidewall accent fabric was replaced, and the crew seats were recovered in January 2019. 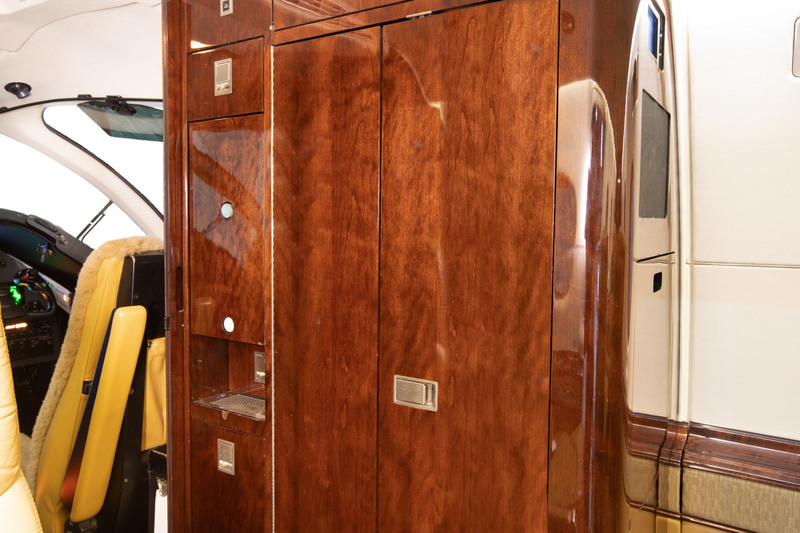 The interior features “Ropey Cherry” gloss veneer, polished silver decorative plating, and “Carmel” cabin carpeting. The cabin headliner and window panels are covered in “Dover” IZIT® Enhanced leather, and the lower sidewall panels are finished in “Maya” leather with “Stacks Plywood” fabric accenting. 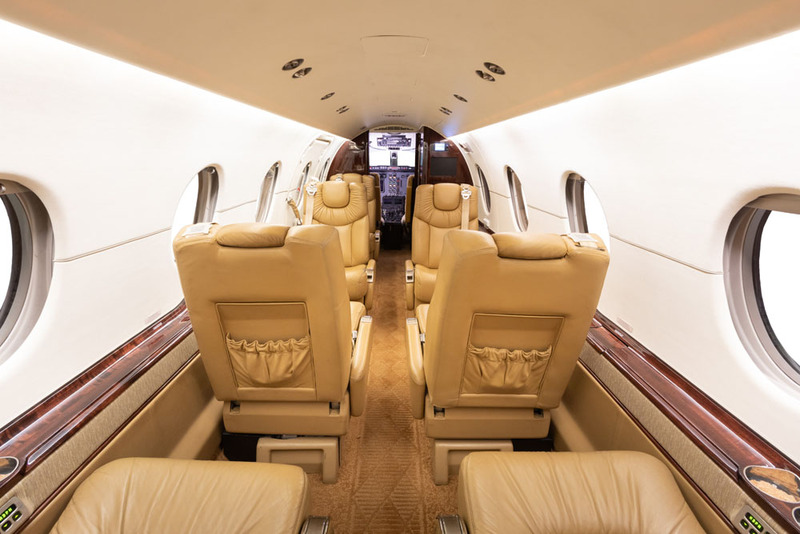 The cabin and lavatory seats are covered in “Maya” leather. The galley is equipped with dual heated liquid containers with drip tray, an ice chest, a trash, and various miscellaneous storage drawers. Opposite the galley is an additional storage compartment with multiple miscellaneous storage drawers. The enclosed aft lavatory is equipped with a left-hand belted toilet opposite a baggage compartment. The main baggage compartment is accessible in the aircraft’s tail cone, the lavatory features a baggage compartment, and there is a forward cabin coat/baggage closet. The exterior is painted in overall Matterhorn White with Black Velvet and Las Vegas Gold stripes.